Better yet, how those who inhabited the Tarim Basin? Columbian looking. I wish I could read the text. 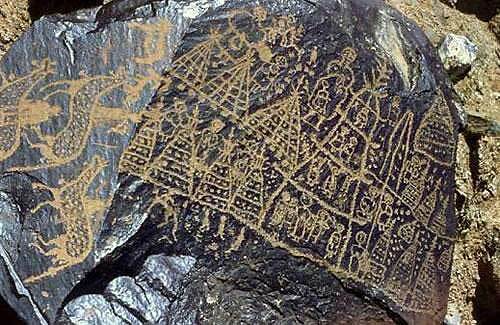 In this Chinese report of the story http://news.hexun.com/2012-04-22/140662189.html , the official surnamed Liu says that the seven vividly carved faces are arranged similar to Ursa Major/Big Dipper/Plough, and may very possibly have been carved by prehistoric people for use in some ritual. Liu also says that the Yinshan faces are similar in many respects to those found in the Helan Mountains and in eastern Russia, and one could infer that as a group the carvings are like a scroll depicting the migration of ancient people, their sacrifices to gods or ancestors, and their totemic worship. I hate to burst your buble but "Eastern Russia" here simply means the (Far) Eastern part of present day Russia and probably has nothing to do with Tocharians or any "Caucasoid" population. To hector, you may be right, but unless you have some information that i don't, I don't believe you can make that assertion based merely on the pictures. Furthermore, are you declaring that there was no Caucasoid population in Mongolia around 2000 BCE? Mongolia is a large country and this is the eastern edge of Mongolia. There was no Caucasoid population there after 20000 BP except a few that are contested or the ones that appear to be the ancestors of present day Mongoloids. Even in Central Asia Caucasoid populations appear in the process of recolonization of the steppe after LGM. They don't necessarily represent the indigenous populations there, otherwise you would have seen Caucasoid Native Americans instead of Mongoloid affiliated ones. I don't have the talent to draw one, but a map would really be helpful here, ideally superimposed on known archaeological cultures of the time period. Do you claim that Mongoloids evolved from Caucasoids? Could you elaborate your statement? Caucasoids predate Mongoloids in Central Asia. The Americas were colonized from eastern Siberia, not from Central Asia. There is a huge distance between Central Asia and the Americas. Caucasoids predate Mongoloids in Central Asia after LGM in the process of recolonization of the steppe. Even that is questionable since all of Caucasoid remains are from Kurgan type burials and native Central Asians may have had different burial practices as some still do;they just cast their dead in the open or cremate them. Also Central Eurasia is not the same as Central Asia. Central Asia is about mid to east Central Eurasia. Many geneticists believe that Native Americans' original homeland was nothern Central Asia like Altai and Tuva before moving to Eastern Siberia and Beringia. Since mongoloid forms did not arise until 20000 BP and did not take hold until long after that, most remains from this period are classified as "Caucasoids" or "Australoids". Note that many early Europeans are also classified as "Australoids". That is just morphologically speaking.